Figure A. RPE-Cy5 tandem conjugated Mouse anti Human CD3 (MCA463C) and A488 conjugated Mouse IgG1 isotype control (MCA928A488). Figure B. RPE-Cy5 tandem conjugated Mouse anti Human CD3 (MCA463C) and A488 conjugated Mouse anti Human CD38 (MCA1019A488). All experiments performed on human peripheral blood lymphocytes in the presence of Human SeroBlock (BUF070A). 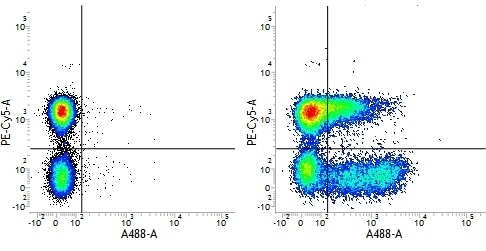 Mouse anti Human CD38 antibody, clone AT13/5 recognizes a ~45 kDa glycoprotein and has a reactivity pattern consistent with antibodies of the CD38 cluster. CD38 is expressed by plasma cells, monocytes, early lymphoid cells and activated T cells. CD38 is widely used to study the processes of B and T differentiation and activation. CD38 is a multifunctional enzyme involved in calcium signaling and Nicotinamide Adenine Dinucleotide (NAD+) metabolism (de Oliveira et al. 2018). Malavasi, F. et al. (1994) Human CD38: a glycoprotein in search of a function. Immunol Today. 15 (3): 95-7. Ellis, J.H. et al. (1995) Engineered anti-CD38 monoclonal antibodies for immunotherapy of multiple myeloma. J Immunol. 155 (2): 925-37. Corcione, A. et al. (2009) CX3CR1 is expressed by human B lymphocytes and mediates [corrected] CX3CL1 driven chemotaxis of tonsil centrocytes. Hovden, A.O.et al. (2011) Maturation of monocyte derived dendritic cells with OK432 boosts IL-12p70 secretion and conveys strong T-cell responses.